Love and hugs are always in season! 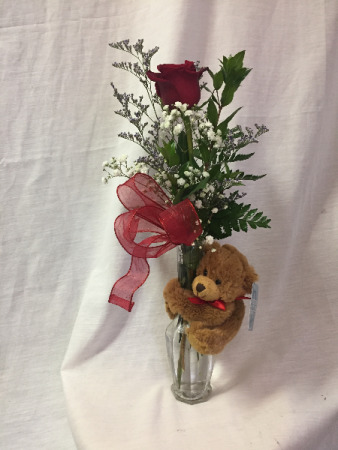 A gorgeous long-stemmed red rose bud vase, with all the fixings, PLUS an extra-special hug from you! *Please note that when upgrading rose arrangements, we we will include additional and/or more expensive accent flowers and greeneries as opposed to more roses. 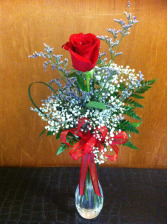 A classic single red rose in a bud vase. 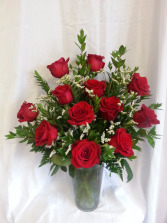 Stylistic, one-sided rose arrangement with beautiful accent greens and flowers. Perfection! 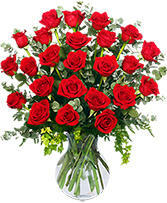 *Please note that upgrading rose arrangements, we we will include additional and/or more expensive accent flowers and greeneries as opposed to more roses.